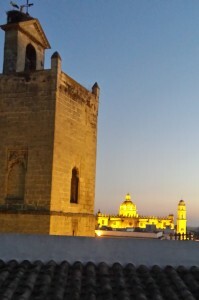 Southern Spain is sweltering right now, with day time temperatures of over forty degrees Celsius. Outside is only truly pleasant in the early mornings or very late into the night. At friends for supper on Friday, we ate inside. We only went to take coffee outside after ten o’clock – and their place is out in the campo, where, one had hoped, it would be cooler. Everywhere is hot. There are forest fires, most notably over the border in Portugal, where people have died, trapped on roads walled with flame, but also nearer to hand. 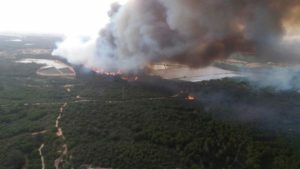 Yesterday brought news of a fire in the Donana National Park, acres and acres of unspoilt wood and marsh land just to the north of Jerez, beyond the Rio Guadalquivir. Let us hope the fire services manage to keep it from spreading further. Our friends in the campo always keep a travel bag ready at this time of year, with immediate necessities, passports and other important documents and money just in case they have to abandon their home in quick time because of fire. In town there is shade, but there is also heat radiating from the cobbles and the concrete. The streets are devoid of life after about one o’clock, in a city which usually throngs with street life before the siesta. People only venture out late in the evening. Shops and places of work are air-conditioned and most folk have some form of acclimitizacion at home. Mine was working overtime. Evidently the Spanish now watch more television than do any other European nation. The reason isn’t difficult to fathom at this time of year. They had used to be avid listeners to the radio, but I guess the technology has changed. Locally the TV news is of a Jerezano bookshop owner who won a mint on the long-running cultural quiz show Saber y ganar. His shop, in the narrow Algarve, always struck me as the ultimate in civilised retail – displaying wine for sale as well as books. I suspect their book club is always over-subscribed. As to my own output, I have been able, this trip, to return to what is now called Reconquista II, for want of a better name. After this Spring’s Festivals I have now to really get down to work on this. My targets were to edit Part One (achieved) and revise it on the laptop (not achieved). There was, however, one curious link to the Clapham Book Festival. My failure to meet target two I ascribe to the fact that I decided to invite folk to Sunday lunch. Two of my guests had recently been reading Stalin’s Englishman, the biography of Guy Burgess by Andrew Lownie, who spoke about his book at the Festival. The Cambridge Spies were subsequently portrayed on stage and screen, most notably by Alan Bennett, but my friend David, a retired actor, recounted his own experience of what he believes is the first portrayal of Burgess (and Philby and Maclean) on the stage. This was in 1951 shortly after Burgess and Maclean fled England and was in a skit called Diplomatic Bags as part of a review – ‘10.15’ – at the Irving Theatre, Irving Street, Leicester Square. The theatre was run by David’s cousin and a young David was working as an usher. Astonishingly, he kept a copy of the Programme and two days after our initial conversation handed me a photocopy. 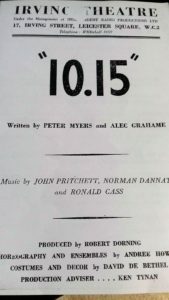 I have it now, with the item listed before the interval, as played by Humphrey Lestocq and Ronnie Stevens, with one Ken Tynan as Production Assistant. I will pass it on to Andrew Lownie. Co-incidence indeed. The title of this post is, of course, from the funeral song in Act IV, Scene II of Cymbeline. 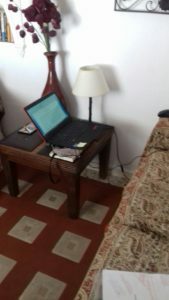 This entry was posted in Books, From a Foreign Field and tagged Books, Foreign field by juliej. Bookmark the permalink.